"In the UK, the Electronics sector is big, valuable and growing; however, the demand for employable graduates is currently outstripping supply." 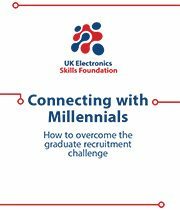 To learn more about how to connect with millennials and overcome the graduate recruitment challenge in Electronics, download our White Paper by entering your details below. Data Protection: By entering your details you are confirming that you are happy for the UKESF to contact you about your interest in the organisation. The UKESF will not share your details with third parties. Please tick this box to receive the UKESF newsletter.